Developers can now invite up to a thousand people to test their beta applications for iOS via its TestFlight tool with just an email address, Apple announced on Thursday. In a post to Apple's developer blog, the company said that up to 1,000 testers can now beta test iOS apps by simply sending an email invitation through iTunes Connect. 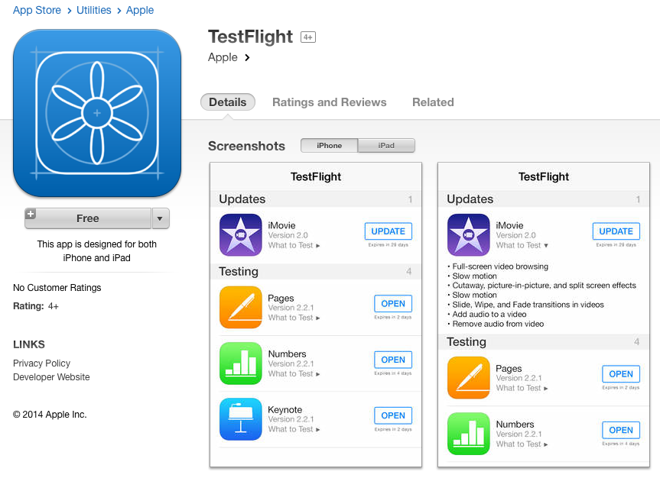 Apple acquired TestFlight in February, gaining an easy way for developers to create and manage public app beta programs. With TestFlight, developers can add beta testers using only their email address, and beta versions can be managed within the TestFlight app itself, without the cumbersome UDID-based provisioning processes used previously. Beta testers are notified as new app versions are released through the TestFlight app, and can perform in-place upgrades. The TestFlight app also allows beta testers to provide feedback, while developers can deploy multiple builds of their app simultaneously. Before Thursday's change, developers were limited to 100 devices per account. But now, developers can invite 1,000 testers per application, with different testers for separate apps.